Temperatures in the Grand Canyon range from lows of around 60 degrees to highs around 100 degrees in May and September. It is warmer in June, July and August, with temperatures ranging between 75 degrees and 115 degrees. Humidity is very low and the sun is very intense. The rainy season usually begins around the middle of July and lasts 4-6 weeks. Afternoon temperatures are generally lower at this time and rain showers can materialize suddenly and disappear just as suddenly. It is best to prepare with good rain gear no matter what time of year you visit as the water temperature of the river is about 48-50 degrees at Lee’s Ferry and only slowly warms as it flows through the Canyon. Fleece or other insulating layers (not made of cotton!) are strongly recommended for trips in April, early May and September. In June, July, and August mid-weight polypropylene should be all you need. 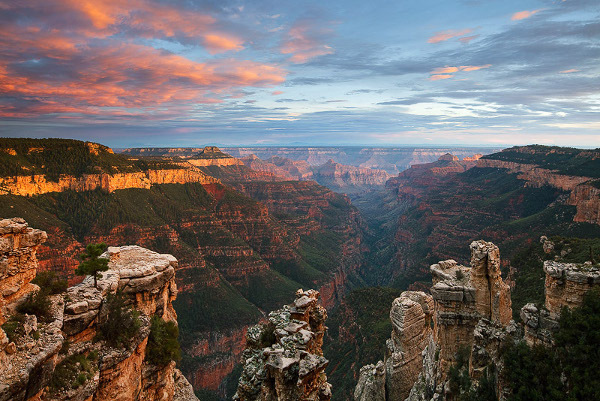 The Grand Canyon is a very user friendly place to go camping. Snakes are rarely seen and generally stay away from campsites and other places frequented by people. Insects are seldom bothersome and those that are common are easy to avoid. Insect repellent is very rarely necessary, though it is listed as an optional item to bring. However, anyone who knows that they are very allergic to certain types of insect stings or bites should definitely bring any medications that they have for just such a situation. Hikes are always optional and they vary in difficulty from a simple walk to occasional short vertical climbs to the more ambitious treks. Most guests are capable of handling all the hikes, but on the longer, more strenuous ones, pre-conditioning will pay off. 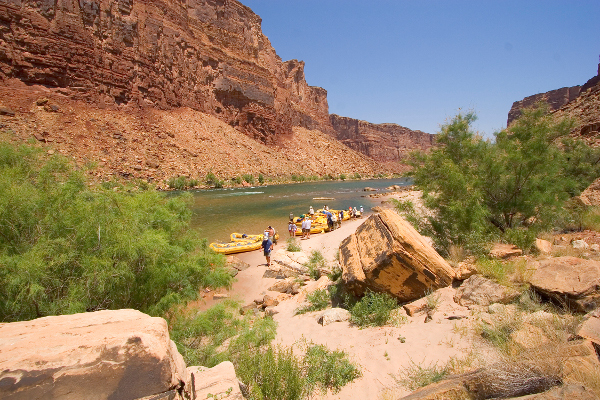 Among trout fishing circles it is widely known that some very good fishing is to be had in the Colorado River! The river has been stocked by Arizona Game and Fish and the fishery is thriving. 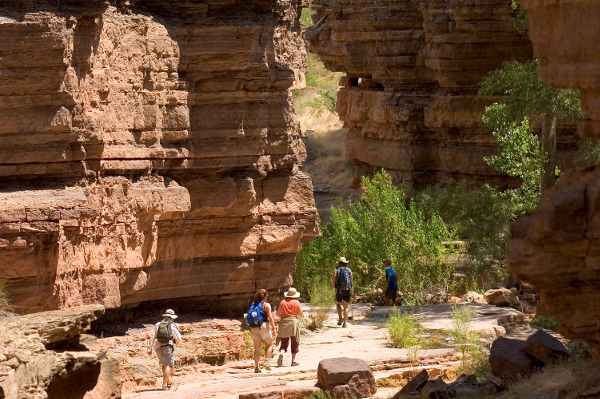 You will need an Arizona Fishing License which can be purchased at Phantom Ranch. During the rainy season fishing is not as dependable. If fishing is a passion you should avoid late July and August. 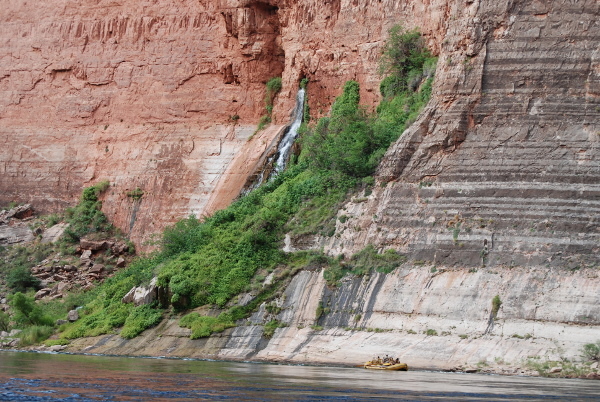 True fishing enthusiasts should choose our Upper Grand Canyon trip as fishing is best between Lee’s Ferry and the confluence with the Little Colorado River, 60 miles downstream. Outdoor Unlimited guides are trained in first aid and carry first aid supplies only. REMEMBER to bring your own prescription medicines. ALERT your guides to any medical problem you might have such as diabetes or allergic reactions. Wilderness expeditions are a long way from hospitals, doctors, and pain-relieving medicines. Evacuations to modern medical care are uncertain, and protracted. In case of evacuation and/or medical treatment beyond first aid, expenses incurred are the responsibility of the participant. 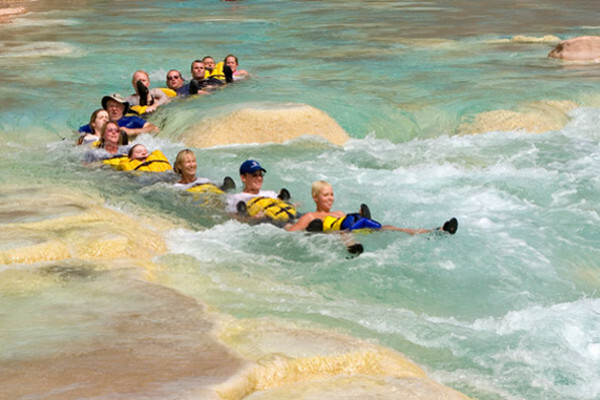 Up to 120 days prior to your trip starting date there is a non-refundable $350/person cancellation fee. Within 120 days of your trip there is NO refund unless Outdoors Unlimited can resell the cancelled spaces. If space is refilled, then all monies will be returned less a 30% cancellation fee. Outdoors Unlimited reserves the right to cancel any trip due to inclement weather or water conditions, insufficient reservations or other factors beyond our control. A full refund will be made immediately if they cannot provide an alternate trip that is satisfactory to you. 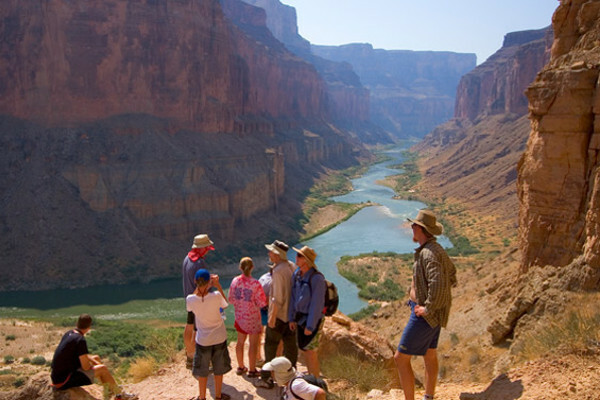 To ensure the quality of your experience and to protect Grand Canyon resources the National Park Service regulates the total yearly usage in the canyon including group size. Paddle trips have a maximum of 24 passengers, high season trips a maximum of 21, and spring and fall trips a maximum of 18-19. Tipping is optional and a personal decision on your part. 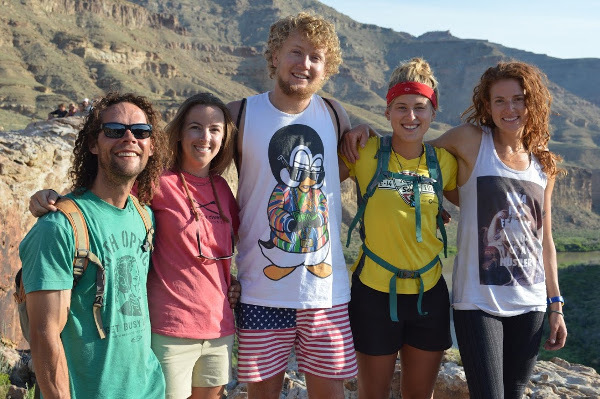 If you feel that your guide’s contribution to your trip was outstanding a tip of not more than 10% of your river trip fare would be adequate to show your appreciation. Outdoors Unlimited cannot provide alcoholic beverages, however, they are allowed to bring your beer and wine for you. With your reservation packet you will receive an order form for a selection of beer and wine available through a local retailer. Once you place your order it is delivered, packed for your trip, and made available to you on the trip. 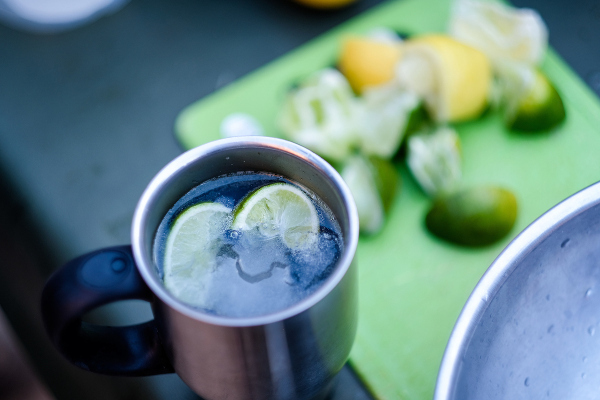 Drinking alcoholic beverages prior to making camp in the evening is discouraged. On the river there will always be fresh drinking water available, as well as powdered drink mixes (such as Gatorade) to flavor and otherwise enhance your drinking water. Water is the preferred choice when it comes to maintaining proper hydration and in such a dry environment your health and happiness depend on it. For those of you who do not wish to order beer or wine an equal amount of soda of different varieties will be on hand as well. Taking a few extra days on the front-end of your trip is well worth some of the great hiking opportunities around the Lee’s Ferry area. There’s all kinds of great hiking in the Cockscomb area of highway 89, the famous “Wave” hike, Buckskin Gulch, the Spencer trail directly above Lee’s ferry (if it’s not too hot). 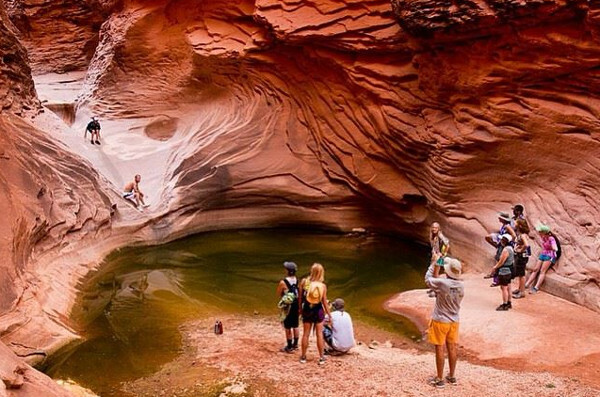 Outside of the immediate vicinity you can also check out The town of Old Paria, or Antelope Canyon outside of Page, AZ. 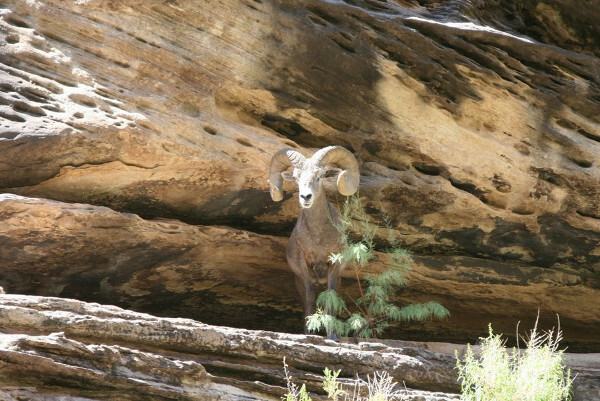 There The is also a myriad of National Parks north towards Kanab. If you’re into Damns, you can check out both Glen Canyon Dam on the front end or Hoover dam on the back end of your trip.